It’s been a heartbreaking week for the rock world as we’re left reeling from the death of Linkin Park singer Chester Bennington, found dead Thursday morning after taking his own life in his Los Angeles home. As family, friends, and fans struggle to accept the grim reality that is life without Chester, the hours following his death saw the rock community stand shoulder to shoulder in fierce determination as they fought to shine a light on a life and legacy marred by trauma – one that saw a child abuse survivor become a Grammy Award winning singer-songwriter fiercely respected by all who crossed his path and left millions better than when he found them. Fun Fact: Aaron Lewis and Linkin Park collaborated on “Krwlng” from the band’s 2002 remix album, Reanimation. Among those offering sweet tribute to their late friend was country singer Aaron Lewis, who took to the stage Thursday night at New Hampshire’s Hampton Beach Casino Ballroom as part of his The Sinner Tour; wearing the weight of sadness that all too many found themselves in that day, Aaron addressed the day’s tragedy, remarking to the crowd, “So… I lost a really good friend today. I’m not really sure why he, uh, he chose to take his own life, but it’s been a really sad day. So this next song, uh… this next song is for Chester,” launching into “Something to Remind You” from Staind’s 2011 self-titled album. 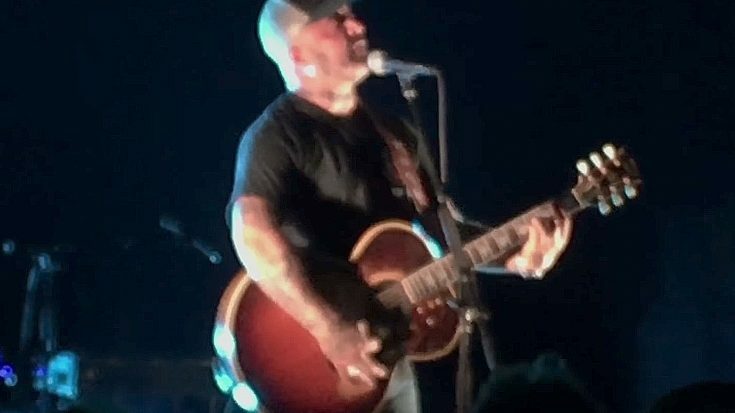 When it comes to channeling the abject heartbreak that is the human experience, Aaron Lewis reigns supreme – unshaken by the noise of the crowd before him, Lewis offers up a tribute to Chester Bennington that stirs every emotion we’ve ever had and we think it’s one that’ll catch you, too. Check it out in the video below and remember – if you’re going through hard times, the sun will rise again tomorrow and things will get better. You’ve just gotta reach out.